The authors are looking into two types of supernovae events, specifically: a type of hydrogen-rich super luminous supernovae (SLSNe II) and what we call Type II-P supernovae (SNe). Type II-P SNe are also hydrogen-rich, but they have a plateau in their light curve, meaning that as the luminosity declines from its peak, it hits a stretch where it declines at a very slow rate. For the case of SLSNe II, magnetars are typically used to model H-free SLSNe (SLSNe I), while interactions with circumstellar material are used to explain SLSNe II. What happens if a magnetar is used to model SLSNe II instead of space stuff around the progenitor star? To create these types of SNe, the authors use a red supergiant star (15 solar masses, 500 solar radii) as the stellar bomb, which serves as the source of hydrogen. They create their magnetar powered model by adding in some extra energy from the magnetar a few moments after the SN explosion. This energy is dependent on the spin-down timescale of the magnetar, as well as it’s rotational energy (the spin-down timescale is a measurement of how the magnetar’s rotation slows as angular momentum is lost, typically due to mass loss). These are the only two free parameters that govern the magnetar’s activity. The results show how the presence of a magnetar, as opposed to a regular neutron star, alters the light curve of the SNe. By including the magnetar in their model, they can (mostly) recreate some of the weirdest SNe out there. Let’s see how they do it. Fig. 2: The SN lightcurve produced by a magnetar (solid blue line) compared to a SN without the magnetar (gray dashed line). The red points on the model light curve denote local maxima, from which the maximum luminosity is derived. The points where horizontal line (dependent on max luminosity) intersects the light curve define the temporal extent of the maximum = 102.3 days in this example. Before using their model to recreate certain SNe, the authors compare the synthetic SNe light curves spawned by a magnetar vs a regular neutron star. They find that with certain values of rotational energy and spin down time, the plateau of the Type II-P SNe can be preserved, but with an intense increase in luminosity before things finally calm down. Oh, and a magnetar just makes it a whole lot brighter, essentially creating a super luminous Type II-P SN (see Fig. 2). These haven’t been observed in real life yet, but when and if they are, astrophysicists will know what to do. The most interesting things to note involve the velocity of the photosphere. See, after a SN explosion, the outward layers of the star fly off the handle at alarming speeds. When the authors model a SN using a magnetar, higher photospheric velocities are produced. Considering how powerful magnetars are, this makes a lot of sense. After comparing the magnetar and neutron star powered SNe, the authors take it one step further and explore how changing the spin-down time and the rotational energy of the magnetar affects the SN. They assume a standard explosion energy, and they find that the magnetar can affect the resulting SN in many different ways. Some of the morphologies they obtained are shown in Figure 3. Fig. 3: Representative light curves from the model grid. 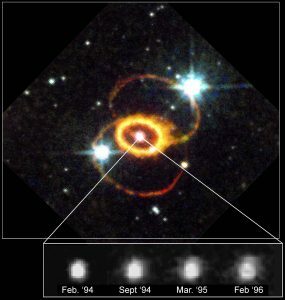 Magnetar-powered SN with differing parameters are shown as different colors (see legend). The same SN without a magnetar is shown as a gray dashed line. From the light curves, you can see that some parameter choices lead to varied maxima in the luminosity of the SN. Some have a well defined peak luminosity, some appear to be Type II-P-like, while some look like a mix of the two. It is clear that in the presence of a magnetar, the magnetar itself defines what we see from a SN. Several conclusions can be gathered from these resulting light curves. For one, the photospheric velocities are more dependent on the rotational energy than they are on the spin-down timescale. The rotational energy also seems to govern how much of the magnetar energy is reradiated in the SN process. Models powered by a magnetar with low rotational energy can reradiate up to a third of the magnetar’s energy, while magnetars with the highest rotational energies cause very ineffective re-radiation. Now for the real test. Can magnetars be used to recreate particularly weird SNe? 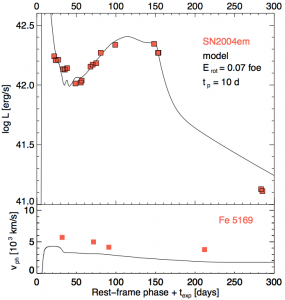 The authors pick two SNe to attempt to model : OGLE14-073 and SN 2004em. Both of these are similar to SN 1987A, a peculiar Type II SN. OGLE14-073 and SN 2004em have been studied in other works, but the parameters required to reproduce their light curves using normal neutron stars are extreme, to say the least. We’re talking huge explosion energies, ejecta masses, etc. The fact that these parameters must be so abnormally high to reproduce the observations indicate that maybe a magnetar is responsible for the weird light curves. Fig. 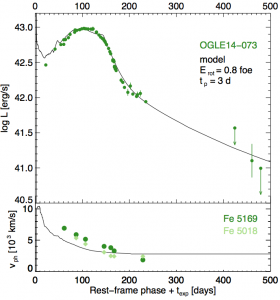 4: Observations of OGLE14-073 (shown in green) compared to the model (shown as a black solid line). Magnetar parameters are given in the upper plot. OGLE14-073 is strange for several reasons. It’s light curve looks akin to SN 1987A’s, but much brighter (click that OGLE14-073 link above to see the light curves compared). The large luminosity followed by a very slow decline is hard to explain. 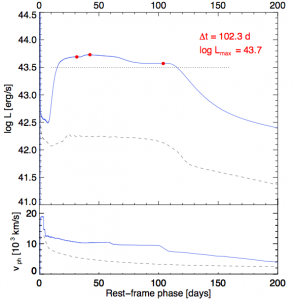 However, the authors are able to match a magnetar powered model to the observational light curve very well. They use minimization to choose the best fitting progenitor mass (25 solar masses), progenitor radius (1200 solar radii), and explosion energy (which turns out to be only slightly higher than the standard previously used). With these reasonable selections, along with certain values for the spin-down time and the rotational energy of the magnetar, the light curve of OGLE14-073 is nearly reproduced by the model. Fig. 5: Observations of SN 2004em (shown in orange) compared to the model (solid black line). SN 2004em is another story. It seemed to be just a weird Type II-P SN, until it suddenly wasn’t – it’s luminosity rose again and seemed to become SN 1987A-like after several weeks. In order to model SN 2004em’s light curve, the authors had to add in some interaction between the SN shock wave and some circumstellar material. With this interaction, they were able to keep reasonable magnetar and progenitor parameters while still fitting the early light curve very well. In the bottom panels of Fig. 4 and 5, you can see that the model photospheric velocities underestimate the Fe II line velocities from observations. Fe II line velocities should indicate photospheric velocity for normal SNe, but it has not been proven that they are good indicators of this parameter in the presence of a magnetar. So, the authors aren’t really worried, since their main goal was to recreate the light curves. And they did! From this study, it seems that magnetars may be the key to explaining strange H-rich supernova events in addition to H-free SLSNe. The authors were also able to note how different magnetar properties change the magnetar’s effect on the SN. As more SNe and magnetars are discovered, astrophysicists will be able to further narrow down how magnetars play into these explosive phenomena.